Young workers are a critical part of the Los Angeles County service economy, particularly in the retail and restaurant industries. They are the faces that greet us in coffee shops, fast food establishments, retail shops, and grocery stores. 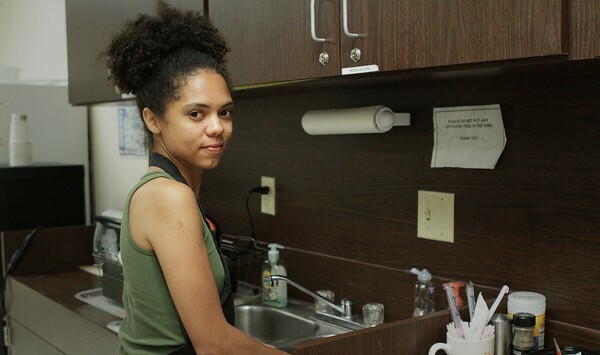 In a recent UCLA Labor Center study of young workers in LA County service jobs, respondents cited unstable work schedules as a pressing issue on the job and in daily life. Erratic scheduling practices, such as unpredictable schedules, lack of advance notice, lack of input, and on-call scheduling, occur in multiple industries; however, they are particularly prevalent in service jobs dominated by young people. National studies show that erratic schedules create significant challenges for low-wage workers, including work-family conflict, poor health outcomes, emotional stress, difficult child care arrangements, parenting struggles, inconsistent school attendance, and income volatility. The vast majority (96%) of workers experience at least one challenging scheduling practice—on-call work, lack of advance notice, or fluctuating schedules—and more than a third (38%) experience all three. Only 4% of young workers have reliable hours. Among young workers, 88% receive less than two weeks’ notice of schedules; more than 40% receive less than one week’s notice. 93% of young workers lack input regarding their schedule. Young workers state that they can’t talk or negotiate with their bosses/employers about their schedules. Nearly 40% have their hours reduced without their input or consent. More than half (60%) work part time, a majority of whom (79%) would like to work more hours. This report was written in collaboration with the Center for Law and Social Policy (CLASP).